Here's how tea tree oil can help you battle your acne and other skin care woes. Tea tree oil is one of the most popular essential oils in use. 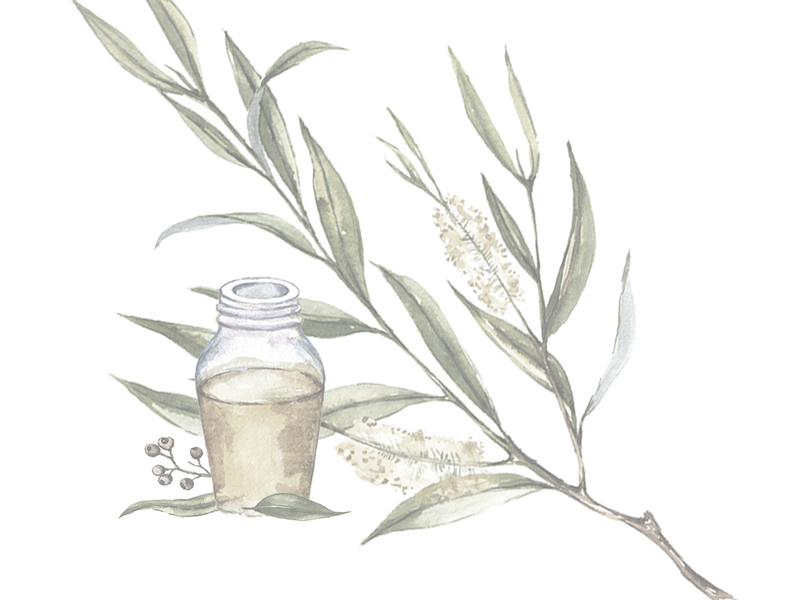 It’s derived from the Australian Melaleuca alternifolia plant, and was used by Australian natives as a natural skin healer for hundreds of years. But that’s not the only reason why we’re so obsessed with using tea tree oil for skin. In the 1920s, chemist Arthur Penfold discovered the antimicrobial properties of tea tree oil—and the rest is history! As natural beauty junkies, we’re huge fans of the fact that tea tree oil is naturally derived and also soothing enough to use on skin. Here are all the ways you can easily include tea tree oil in your beauty routine. What makes tea tree such a powerful skin care ingredient? It’s been used as a natural remedy for hundreds of years, and more recent scientific studies are shedding light on the specific properties that make it so effective. Here are the top benefits of tea tree oil that contribute to its popular use in beauty products today. The key lies in its potent antimicrobial properties. Tea tree oil contains active components such as terpinen-4-ol to eliminate bacteria and fungi that are common culprits for skin infection. When your skin ruptures, it’s more vulnerable to bacterial infection that can delay repair and even encourage scar formation. Tea tree oil is able to promote skin healing by eliminating these harmful microorganisms. What’s most noteworthy is that it’s effective against S. aureus, which is a bacteria known to cause many troublesome skin and tissue infections. Tea tree oil contains anti-inflammatory properties, and has been found to soothe inflamed skin. Research is still ongoing on the antioxidant properties of tea tree oil for skin. In the meanwhile, it’s already a remarkably versatile beauty ingredient to help target a range of skin care woes. By limiting the growth of harmful bacteria, providing a safe environment for wound repair. That means it’s ideal for helping prevent infection, which can happen with certain skin conditions that cause weakened, itchy skin, as well as acne. In addition, it helps to activate immune cells for tissue repair. Tea tree oil has been shown to inhibit the growth of melanoma cells, suggesting that it’s effective in fighting skin tumor cells. Do you know what exactly causes those dreaded pimples on your face? The answer isn’t as easy as oily skin. It’s true that hormonal changes can trigger oily skin. Acne forms when bacteria infects clogged pores. Tea tree oil is a proven treatment against acne-causing bacteria, so including it in your daily facial cleanser will help zap those pesky microbes from your pores. It’s a more gentle, natural alternative to benzoyl peroxide that causes peeling, irritation, and sensitivity to the sun. 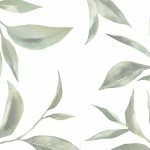 Tea tree oil is a potent ingredient, so it’s best to stick to skin care products that have a low concentration of it when using it on your whole face, especially when you have sensitive skin. An easy way to prevent acne is to simply use a cleanser with tea tree oil in the AM and PM. This gel lathers up into a foam to deeply cleanse oily and acne-prone skin. In addition to tea tree oil, this cleanser includes activated charcoal to purify pores. Contains tea tree and a blend of detoxifying herbs for a refreshed cleanse. Lemon water, glycerin, and algae hydrate for radiant skin. Already in the middle of a breakout? No fear. 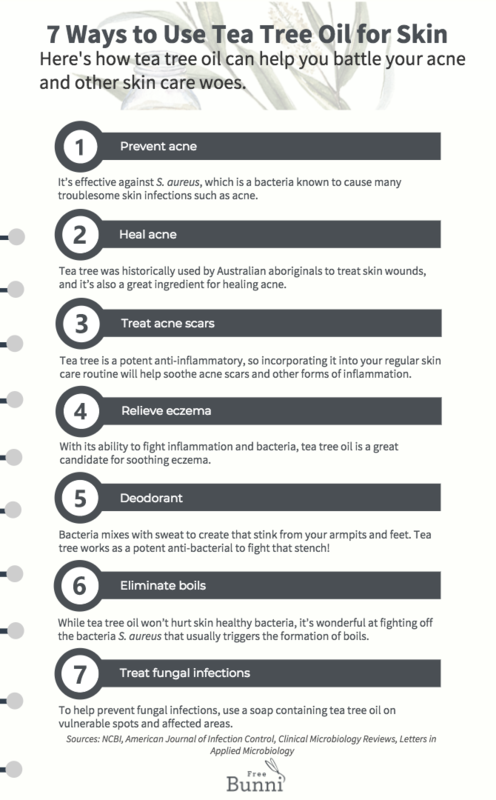 Tea tree was historically used by Australian aboriginals to treat skin wounds, and it’s also a great ingredient for healing acne. Acne formation itself–and not just popping your pimples–causes your skin to rupture. A serious example of this is cystic acne. Bacteria can invade open skin wounds and prevent healing, leading to a never ending acne nightmare! If you’re itching to make your breakout go away, tea tree works great for acne spot treatment. Dilute tea tree oil in a 1:20 ratio with a carrier oil such as coconut oil, and apply to acne with a cotton swab. You can also pick up the Clear Skin Targeted Treatment from Eminence Organics for easy, on-the-go treatment. Contains a blend of tea tree oil as well as other potent acne-fighting botanicals. 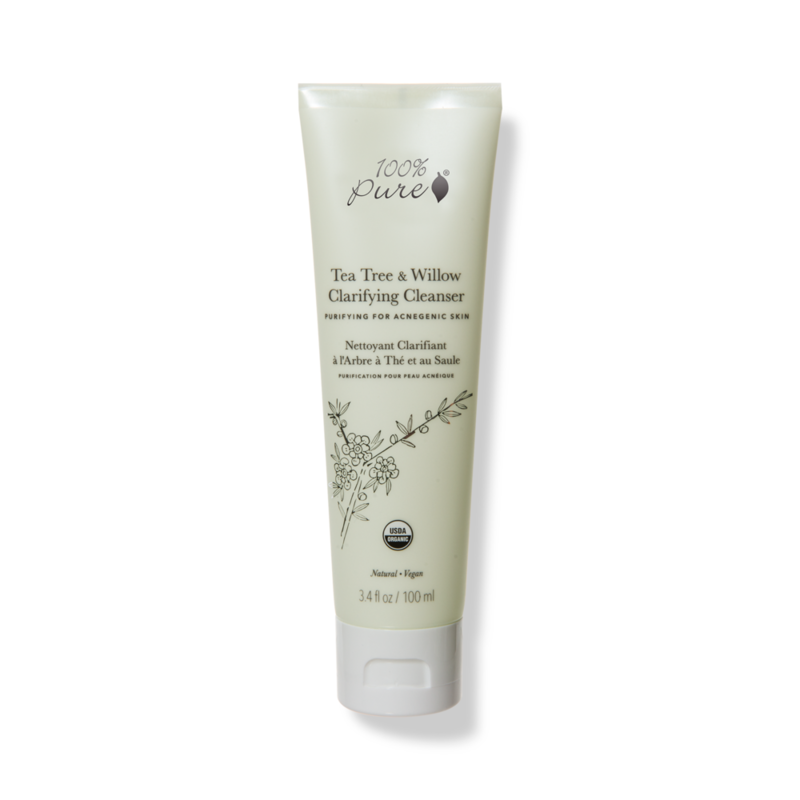 Buchu leaf extract and salicylic acid from willow bark help reduce pore size to fight against excess oil. Acne scars don’t just develop from picking at your pimples, they result when pores become clogged enough to break skin tissue, triggering inflammation. This can happen with recurring breakouts, so it’s important to continue preventative treatment even after your acne has faded. Tea tree is a potent anti-inflammatory, so incorporating it into your regular skin care routine will help soothe acne scars and other forms of inflammation. 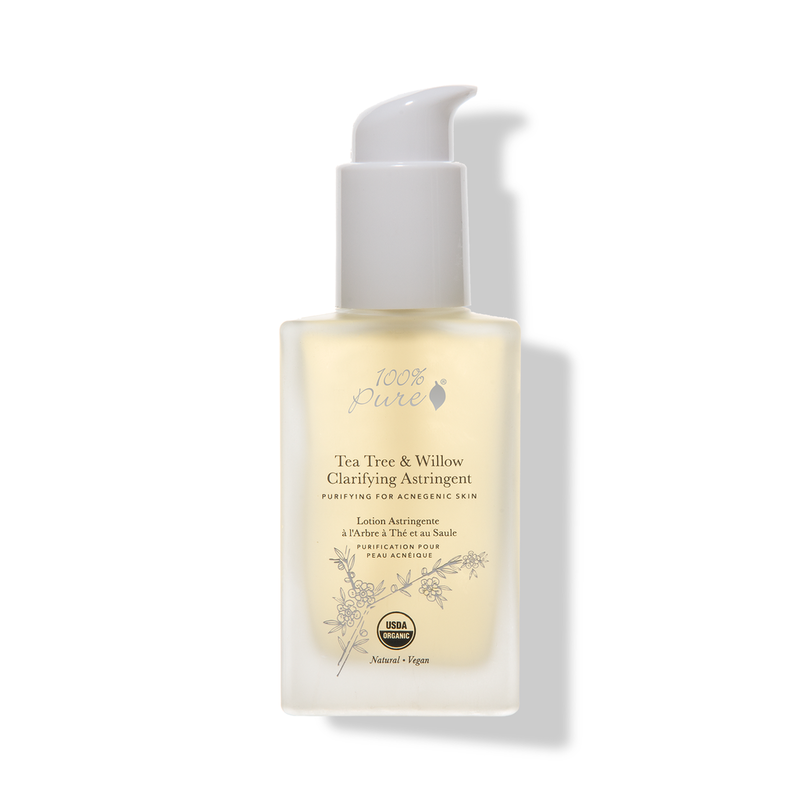 Using an astringent with tea tree oil such as the Tea Tree & Willow Acne Clear Astringent from 100% Pure is a great way to clarify and tighten pores to prevent acne scar formation, as well to hydrate with hyaluronic acid to promote skin healing. 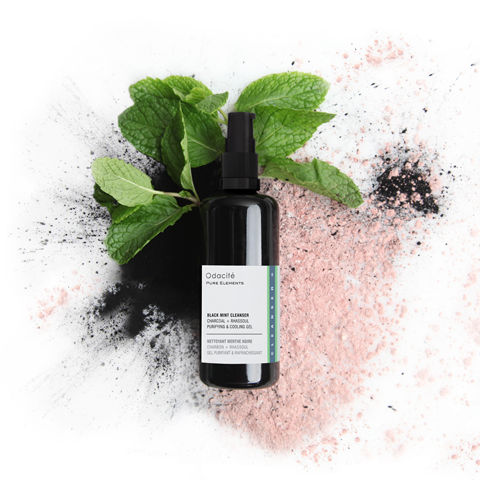 This anti-inflammatory toner is a refreshing spritz of relief for oily or acne-prone skin. Tea tree and other antibacterial herbs purify skin, while algae extract hydrates for smoother, softer skin. Eczema, also known as atopic dermatitis, is an inflammatory skin condition that result in patches of dry, itchy, reddened skin. And while you might not be able to stop yourself, scratching eczema can lead to painful skin wounds and bacterial infections. With its ability to fight inflammation and bacteria, tea tree oil is a great candidate for soothing eczema, especially when used in a nourishing moisturizer such as the Blemish Balm from Osea. A lightweight moisturizer that still provides deep nourishment for irritated or inflamed skin. Includes tea tree oil on a nourishing base of algae extracts to rebalance skin with minerals and essential fatty acids. Bacteria mixes with sweat to create that stink from your armpits and feet. The problem with most deodorants is that they contain harsh chemicals and carcinogens. Studies are currently still researching the possible link between underarm deodorants and breast cancer. While we do want to work on fighting that stench, we’d rather do it without the cancer risk. Stick to a underarm cream that runs on the natural power of tea tree oil instead, such as the Deodorant Cream from Meow Meow Tweet. Not all bacteria is bad too. Avoiding conventional antimicrobial chemicals such as triclosan will also avoid killing off the bacteria that are beneficial to your skin health. Looking for odor control without the possible cancer risk? This cream will be your go-to. Tea tree fights odor-causing bacteria, while coconut and jojoba oil nourish sensitive underarm skin. While tea tree oil won’t hurt skin healthy bacteria, it’s wonderful at fighting off the bacteria Staphylococcus aureus that usually triggers the formation of boils. Treating boils with natural ingredients such as tea tree oil will also help discourage scar formation. Dilute tea tree oil with a carrier oil in a 1:20 ratio, and apply to boils with a cotton swab. Fungal infections are not only hard to get rid of, they also spread easily on your body, especially with scratching. Fungi thrive on dead skin, hair, and nail cells, and are spread from direct contact. They love warm, wet areas, so they’re often found in gym rooms. Some common fungal infections include nail fungus, athlete’s foot, and ringworm. Get a fresh clean with this bar soap featuring plant superstars. Tea tree oil and activated bamboo charcoal purify infections, while coconut and olive oil nourish and moisturize for balanced skin. Remember, tea tree oil is a potent active ingredient. It’s best to first dilute it in a 1:20 ratio with a carrier oil, such as argan oil or jojoba oil that are more compatible with skin. For example, mix 1 drop of tea tree oil with 20 drops of jojoba oil to create a 5% concentration of tea tree oil. 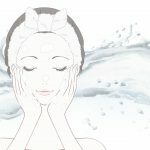 People with sensitive or dry skin may want to dilute the oil even further. Tea tree oil is toxic to ingest, so keep it away from areas near your mouth, as well as from pets. As with any new product or ingredient, remember to consult your doctor first before first using tea tree oil, especially for an existing condition. Stop use when you observe any side effects. Tea tree oil deserves a 5 star rating because of its ability to treat so many skin conditions. It’s widely offered in a variety of cosmetic ingredients, and is easily available for you to create your own diluted formulas. If you’re purchasing a product with tea tree oil, make sure to examine the other ingredients in the formula. Now fight your way to better skin health (the natural way)! Ready to show more love to essential oils, one of the simplest yet most potent natural remedies? 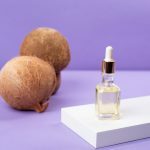 Best Essentials Oils for Skin: How to use essential oils to easily target acne, dry skin, and aging skin. 9 Lavender Oil Uses for a Healthier Natural Lifestyle: Looking for a does-it-all natural remedy to help boost your health? Lavender oil might do the trick.